About 7 years ago, through Metawriting, I asked my unborn little sister (who also acts as my Guardian Angel and more.) a very personal question to ask from Jesus, since she is in close rapport with Him! After a few weeks, she approached me again and I asked her if by any chance she had had the chance to do what I had asked of her, and if she had had an answer, as I was badly in need of. She told me that that indeed she asked, and she did obtain an answer, but she would only tell me the answer at the right time, or maybe even Jesus would do so Himself! My patience was rewarded last year when I had a dream, I dreamt that I found myself in the Sanctuary of the Madonna of the tears in Syracuse, Italy, I was admiring the painting and all of a sudden I heard a masculine voice coming from the painting itself, the voice was giving me the answer to what I had asked of my little sister many years beforehand. Within the same dream, since I was not completely convinced, I asked for a sign to tell me if that dream was reality or just a dream, and a voice told me. 'Since you still have doubts, you will see me behind the Mother'! 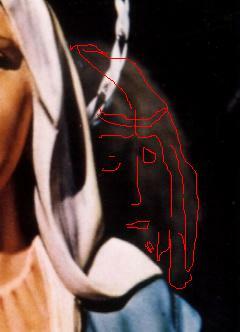 In my dream I kept looking and looking at the paining of the Madonna but I could not discern anything! After a few days I forgot all about it and did not give it any more thought. The proof did not take long to arrive. As a matter of fact, a really good friend of mine a few days later told me:' I have to show you something and I believe it's for you'. 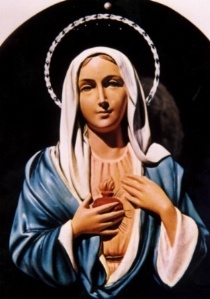 I could not quite understand what he meant, I thought I had forgotten something back at his house one of the last times I visited him, instead he showed me a picture that my friend's father, Giuseppe, had taken of the painting of the Madonna of the tears in Syracuse. When I saw it, I immediately heard the famous sentence resonating in my head: . 'Since you still have doubts, you will see me behind the Mother'! That's when I understood why that voice said those words, if you look at the picture, it's really quite obvious! The picture was given to me right away, I am now awaiting the negative that my friend has promised to give me!